For Hubby's Birthday I made a pineapple and banana cake with a cheese and buttercream frosting (absolutely delicious- recipe coming soon). As I had some pineapple leftover that wasnt very sweet, thought of incorparating it into a savoury recipe. Since the last couple of days we've seen weather thats been chill, with gale force winds, and bursts of rain (thats summer for you in England brrrrrrrr!! 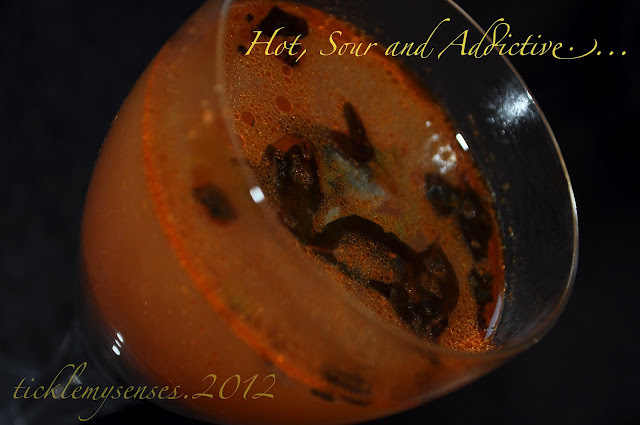 )......a hot and spicy drink was in order and the first thing that came to mind was a rasam ( spicy soup). Its been ages since I made a rasam and as I scrolled through my dog earred handwritten recipe book (scribbled in the weeks before I got married) I found moms lentil- free, easy tomato rasam recipe, which is my absolute favourite and decided to adapt it a little bit for this one. I substituted one of the two tomatoes in her recipe for 2 slices of pineapple, chopped the pineapple into bits and added it to the usual list of rasam ingredients, skipped the tamarind for Kokum/ mangosteen leaves (see notes below for more on kokum leaves) and 15 minutes later I had a tummy warming, palate cleansing, invigorating tangy soup whose aromas were wafting through the whole house....awakening those hunger pangs. It was delicious. Best eaten with plain rice and poppadums ( lentil/ rice based crispies) or served as an appetiser. 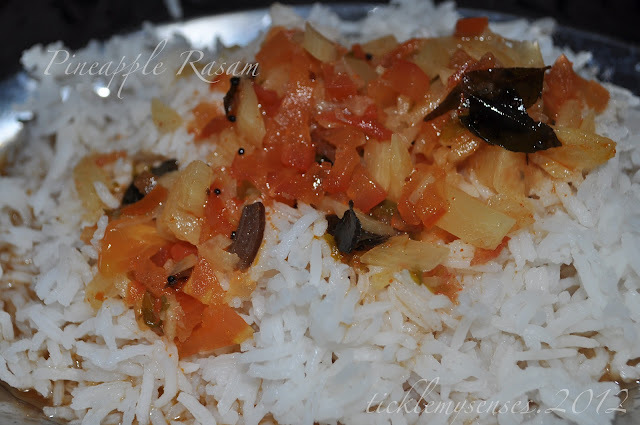 Warning: Avoid making this rasam if you are on a low Carbohydrate diet, its astonishing how it can awaken those demons within the tummy that blanks the mind and makes your hand reach out for those prohibited second and third helpings of rice...lol. 2. Cut pineapple and tomato into small cubes, place along with soaked kokum and its soaking liquid in a large vessel with 750ml hot water. Bring to a boil. 3. Once its boiling add chopped coriander leaves. Close the vessel and let it cook on a medium flame. 4. Once the tomatoes have softened, turn heat down to lowest setting and do tadka. Heat oil, add mustard seeds, when it sputters add curry leaves and chopped garlic flakes fry till garlic slightly browns, add hing, take off fire and add rasam powder. Pour seasoning over the rasam. 6. Add salt and jaggery to taste. 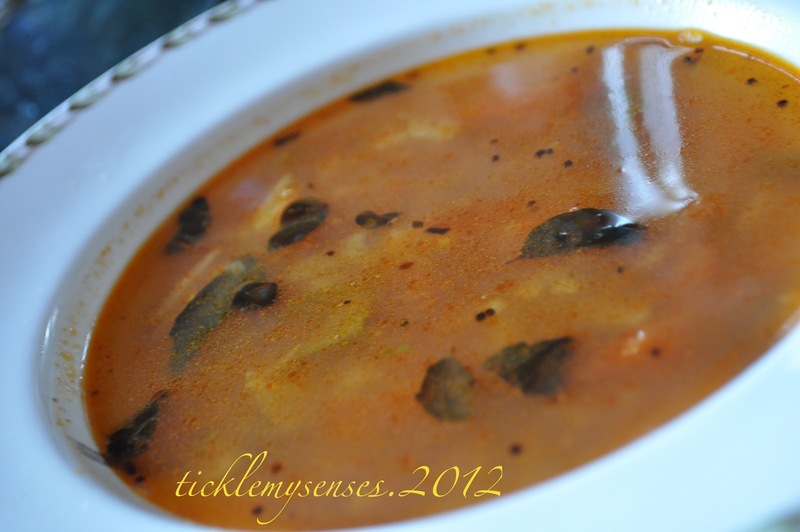 Allow the rasam to simmer gently for 2-3 more minutes. Turn off heat. 1. If you do not have pineapple, add another medium size firm tomato. 2. Kokam is the sun dried outer covering of the kokam/ mangosteen fruit. It very commonly used as a souring agent in Mangalorean/ Konkani and Marathi cooking. The fruit is also known as amsol, bhinda, katambi, looikya, sour apple or panarpuli. Substitute with tamarind or vinegar if you cannot get hold of the dried kokam pieces.If you do not have kokum leaves/ mangosteen substitute with a lemon size ball of tamarind. Soak the tamarind in warm water and add its squeezed out juices. very yummy and belated b'day wishes to your hubby..
Love your recipe and your idea to substitute tomato with pineapple!